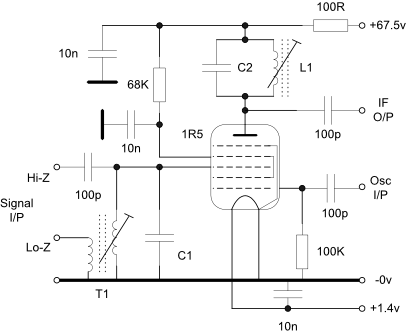 The 1R5 may be used as a self oscillating mixer up to about 20MHz or as a mixer with an external oscillator as shown here. As with any multi-grid mixer the noise factor is high but should be adequate on the lower HF bands. This mixer uses a 1L4 sharp cut-off pentode with filament/cathode oscillator injection. 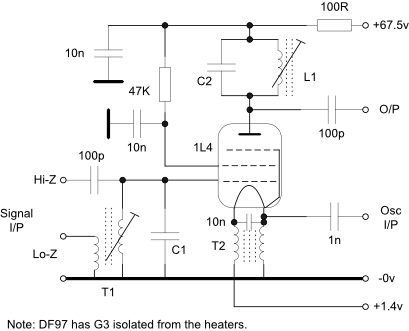 A DF97 will provide a similar performance but with less stray coupling between the filament and anode because the suppressor grid is not connected to one side of the filament and may be grounded. T2 is a bifilar wound transformer using a ferrite core. The reactance of each winding at the lowest oscillator frequency should be several times the impedance looking in to the filament. Results: An anode tuned circuit at 3.4MHz was chosen with an initial L/C ratio that provided a gain as a grounded filament/cathode amplifier of x20 (C2 = 100pF). The circuit was then configured as the mixer above with cathode injection and results measured from the high impedance input to the high impedance output. As expected the 1L4 (sharp cut-off pentode) and DF97 (100MHz osc/mixer pentode) showed improved conversion gain compared to the 1T4.